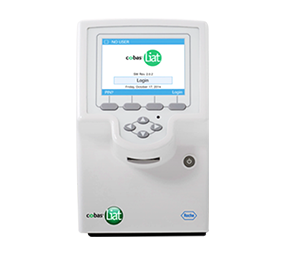 cobas Liat System | The only real-time PCR system that's CLIA-waived for Influenza A/B, RSV and Strep A in 20 minutes or less. Sign me up for the latest news and updates. Send package inserts. Have a sales representative contact me. CLIA-waived, lab-quality Influenza A/B, RSV and Strep A testing at the point of care. CLIA-waived, lab-quality Influenza A/B, RSV and Strep A testing at the point of care. No confirmation necessary at the time of visit. CLIA-waived, lab-quality Influenza A/B, RSV and Strep A testing at the point of care. No confirmation necessary and no age restrictions. The only real-time PCR system that's CLIA-waived for Influenza A/B, RSV and Strep A in 20 minutes or less. 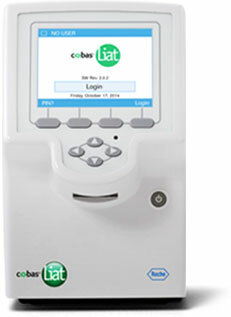 The cobas® Liat® System brings lab-quality testing to the point of care, delivering accurate results in 20 minutes or less – enabling you to make the best treatment decisions possible when your patients need it most. Real-time PCR at the point of care. Three simple steps with test results in 20 minutes or less. Confidently treat patients the day you conduct the test. Whether results are positive or negative, you can confidently treat at the time of the patient visit without the need for confirmation. How is the flu near you? Roche Diagnostics provides this tool for information purposes only and is not responsible for the content. Content provided and maintained by the US Centers for Disease Control and Prevention (CDC). Provide answers at the appointment. When there's a pressing need for a diagnosis and treatment decision, patients rely on you for answers. With the cobas® Liat® System, there's no need to confirm negative test results at the time of visit – so you can make the right treatment decision right away. Lab-quality results at the point of care. The cobas® Liat® System brings molecular testing with real-time PCR to the point of care. Compact and easy to use, it's designed for STAT testing to support time-sensitive diagnoses and treatment decisions. All nucleic acid testing processes are fully automated, including sample preparation, amplification and real-time detection. Each cobas® Liat® assay tube contains all assay reagents for a single test, prepared in isolated segments – add nothing but your patient sample. The cobas® Liat® Analyzer compresses the assay tube to selectively release reagents from tube segments, moves the sample from one segment to another, and controls reaction conditions at different temperatures. FDA 510(k) cleared and CLIA-waived. The cobas® Strep A nucleic acid test for use on the cobas® Liat® System (cobas® Liat® Strep A) is a qualitative in vitro diagnostic test for the detection of Streptococcus pyogenes (Group Aβ– hemolytic Streptococcus, Strep A) in the throat-swab specimens from patients with signs and symptoms of pharyngitis. The cobas® Liat® Strep A assay uses nucleic acid purification and polymerase chain reaction (PCR) technology to detect Streptococcus pyogenes by targeting a segment of the Streptococcus pyogenes genome. The cobas® Influenza A/B nucleic acid test for use on the cobas® Liat® System (cobas® Liat® Influenza A/B) is an automated multiplex real-time RT-PCR assay for the rapid in vitro qualitative detection and discrimination of Influenza A virus and Influenza B virus RNA in nasopharyngeal swab specimens from patients with signs and symptoms of respiratory infection in conjunction with clinical and epidemiological risk factors. The test is intended for use as an aid in the differential diagnosis of Influenza A and Influenza B in humans and is not intended to detect Influenza C.
Cut steps. Speed up treatment. Collect sample and add to assay tube. Scan assay tube and sample. Insert assay tube to start test.